I am: Drawing, gaming, eating, or belching. Hobbies: Drawing, cooking, baking, sewing, building, gaming, writing, making music, sculpting, etc. Favourite Quote: "Like I said... It isn't necessary for me to touch you. it's just one of the perks." -Karasu, Yu Yu Hakusho, Episode 55. Biography: I suddenly began to exist and continue to do so. I have a lot of nicknames so feel free to call me by whichever one you care to. 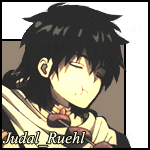 This includes but is not limited to: Greece, Rose, Rayflo, Judal, Rosen, Kurama, Karasu, Sky, and my name, Ruehl.